The 10 Best Milkshakes in Iowa! Nothing beats an ice-cold milkshake served to you with a smile. Whether you’re looking for something to cap off a delicious meal, or are interested in a mid-day treat, a milkshake is the way to go. Spread across Iowa, ranging from diners, burger joints, drive-thrus and ice cream parlors, there’s many places to find a milkshake made right. To help you on your milkshake mission, it could be helpful to check out these 10 best milkshakes in Iowa. Without a doubt, the Hamburg Inn No. 2 of Iowa City sets a high bar for milkshakes in the state of Iowa. That’s because besides the classic American entrees they serve the whole day through, the Hamburg Inn No. 2 also offers patented pie shakes, which includes an entire slice of pie blended together with your ice cream. Ranging from bumbleberry to mint Oreo cream, all flavors and ice cream combinations at the Hamburg Inn set you up right for a winning milkshake. If zombies one day decide to invade, chances are even the undead will enjoy the fun selections of milkshakes found at the Zombie Burger and Shake Lab. Featuring both alcoholic and non-alcoholic selections, the milkshakes at Zombie Burger are far from your ordinary ice cream treats. Including flavors like Chocolate Nutella Marshmallow and Zombie Joe (vanilla ice cream, coffee syrup & whip cream), with all milkshakes available to be spiked with a little something extra or not, you’re sure to taste something a little different at Zombie Burger. While the craft beer and house-made burgers might bring you into Central Standard Burgers, it’s the milkshakes that will bring you back for more. Featuring the old classics and some new standards like Chocolate Brownie Overload or Donuts and Coffee, these first-class milkshakes are worth the visit alone. There’s no doubt that you can find a full meal at Central Standard Burgers, but to top it off with one of their state-famous milkshakes would make for a complete dining experience. One hundred percent locally owned and operated, Burgerfiend of Cedar Rapids takes pride in the quality ingredients that goes into everything found on their menu. Including their milkshakes that are made simply made with cream, milk, sugar, egg yolk, and vanilla—nothing more. At Burgerfiend, you have the choice between the three classic flavors: vanilla, chocolate, and strawberry, plus the option to throw in a banana. Whichever flavor you choose, you really can’t go wrong, especially if you precede it with one of the best burgers in Cedar Rapids. A hot spot for Drake University students and the surrounding Des Moines community, the Drake Diner embodies a great American tradition of breakfast foods served all day and milkshakes made to order. Whether you are stuck studying for finals, or just need a sweet treat to get you through your day, the Drake Diner has a long list of milkshake reasons to visit. With a great variety of milkshakes to choose from though, it’s hard to say which is best, but you can never go wrong with whatever you order from this classic and original Des Moines diner. Serving the Ames community for nearly 50 years, Hickory Park Restaurant Co. knows how to put together an appetizing menu that makes choosing hard to do. With over 100 items and flavor combinations on their dessert menu alone, including 40-plus milkshake flavors, you’ll could spend a lifetime not tasting everything Hickory Park has to offer. Ranging from root beer to raspberry, from peppermint to pineapple, Hickory Park has all your favorite flavors of milkshakes and plenty you didn’t know existed. Trying something new for yourself at Hickory Park and enjoy all the flavors. Billy-Boy Drive Thru is a great burger joint where you can find tasty treats throughout the day, including 35-plus flavors of milkshakes. Whether you go fora classic like Strawberry or Vanilla, or you mix it up with something more flavorful like Irish Cream or Macadamia Nut, a high recommendation is to get a burger to go alongside it, maybe even some fries. A great place to catch a quick bite or feed the whole family, the eating experience delivered from Billy-Boy Drive Thru is always fun, especially when you include the milkshake. With three different locations in the Cedar Valley, there is triple the chance to discover the tasty treats being sold offered by the 4 Queens Dairy Cream. With an incredibly long list of ice cream indulgences that could have you trying something new every day of the week for the next three summers, the milkshakes rank amongst the most appealing. Featuring flavorful add-ins that you can mix into your milkshake, including butterscotch, peanut butter or peach, however you want to satisfy that sweet tooth, 4 Queens Dairy Cream has quite the arsenal to deliver big. Located alongside the Wabash Trace Nature Trail, there is no better fuel for your bike ride than a milkshake from Tastee Treet. A true tasty treat indeed, this local establishment is open seasonally and provides some of the best milkshakes and ice cream treats you’ll find in the state. With eleven different milkshake flavors to choose from, there’s 11 good reasons to give Tastee Treat a try, add in the other ice cream treats and grill items though, and you’ll find a good reason to check it out all summer long. Featuring all sorts of flavors and served in a souvenir cup, the milkshakes at Duke’s Burgers can really put a sweet finish towards a Lake Okoboji vacation. Featuring all sorts of unique flavors like mint cookie and strawberry cheesecake, if the burgers and fries don’t fill you up at Duke’s, the milkshakes surely will. 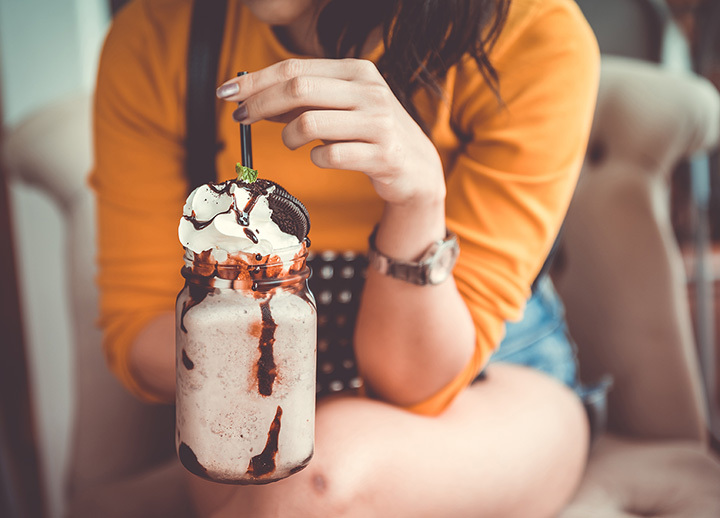 With quick access to the shoreline after you eat, Duke’s is a great place to recharge or unwind during your next trip to Okoboji, just don’t be surprised if the milkshake is one of the things you remember most.